GREG BAKER/AFP/Getty ImagesChina’s President Xi Jinping swears an oath after being elected for a second term during the fifth plenary session of the first session of the 13th National People’s Congress (NPC) at the Great Hall of the People in Beijing on March 17, 2018. China’s President Xi Jinping gave a nationalistic speech on Tuesday, saying Beijing will “fight the bloody battle against our enemies” and not cede “a single inch of land” in regards to Taiwan and Hong Kong. Xi has a hardline approach to Taiwan, and experts believe he intends to reunify Taiwan with China in coming decades. The new US law regarding official travel between the US and Taiwan may have also prompted his fiery speech. 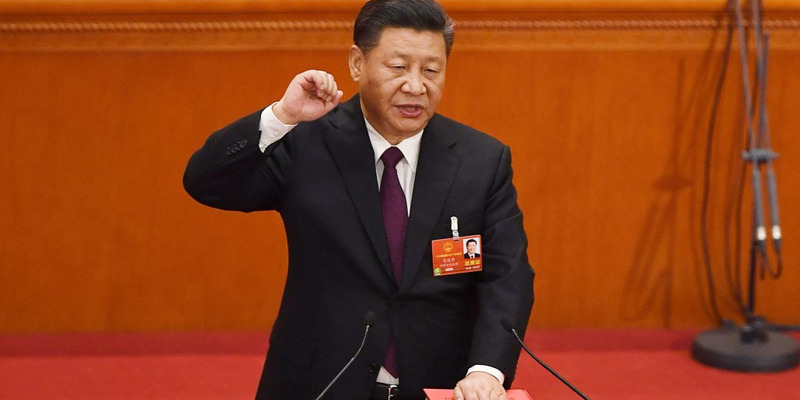 President Xi Jinping said China will “fight the bloody battle against our enemies” in a speech on Tuesday, striking a nationalistic and hawkish tone. In his closing speech of the country’s annual legislative meeting, Xi discussed the benefits of China’s socialism, the Belt and Road initiative and a string of domestic policies, zeroing in on Hong Kong and Taiwan. “We are resolved to fight the bloody battle against our enemies … with a strong determination to take our place in the world,” Xi said, according to CNN. Xi also said any separatist action to seek independence in these territories would be doomed to fail. “The Chinese people have strong determination, full confidence and every capability to triumph over all these separatist actions. The Chinese people and the Chinese nation have a shared conviction which is not a single inch of our land will be and can be ceded from China,” Xi said. While it was not clear if China’s president was referring to any particular incident, state-run media one day earlier threatened “military pressure” and drills would resume if US and Taiwanese officials began visiting one another under the new Taiwan Travel Act. China considers the self-ruled, democratic island to be a province of China that will one day be reunified with the mainland. Beijing refuses to have diplomatic relations with any nation that treats Taiwan as a country, and relations between China and Taiwan worsened since Tsai Ing-wen, Taiwan’s independence-leaning leader, became president in 2016. Xi, who oversees all Taiwan affairs, also focused on reunifying Taiwan and China during a major speech to the Communist Party last year. Analysing that speech, some experts estimate that Xi’s is hoping for reunification by 2050 – by peaceful means, or by force, if necessary. Xi also focused on increasing the “national identity” and patriotism of citizens in Hong Kong and Macau. Earlier today, Human Rights Watch issued a report on plans for Hong Kong legislators to discuss a law that criminalizes the insulting of the Chinese national anthem. The punishment for those who alter the lyrics, score, or sing in a derogatory manner, could be up to three years in prison. “Hong Kong Chief Executive Carrie Lam has played down fears the bill could be politicized, saying it merely aims to encourage ‘respect’ for the anthem. Yet she has not acknowledged citizens’ concerns about forcing their political loyalty to Beijing, or how mainland authorities’ frequently jail people for peaceful criticism,” Maya Wang, Human Rights Watch’s senior researcher on China. “We will continue to implement One Country, Two Systems principle: Hong Kong people governing Hong Kong, Macau people governing Macau, and a high degree of autonomy in the Special Administrative Regions (SARs). We will continue to stick to the constitution and basic laws in governing the two regions and support the SARs and its chief executives in implementing its functions and supporting hong Kong and Macau in integrating into the larger picture of the country. We will continue to strengthen and foster the national identity and patriotism of people in Hong Kong and Macau SARs and maintain longterm stability and prosperity in Hong Kong and Macau SARs. We should continue to stick to the One China principle, 1992 consensus, advance the development of cross-strait relations, and expand the economic and cultural exchanges between the two sides. By doing so we will make sure that people both in Taiwan and the mainland will share in the development and improve its well-being and also advance the unification of the country. We should safeguard the sovereignty and territorial integrity of the country and achieve full reunification of the motherland. This is the aspiration of all Chinese people and this is also inline with the fundamental interests of the Chinese nation. Faced with this very important question of our nation and history, any action that aims to separate the country is doomed to fail.